Cruise nature's laboratory, the Galapagos Islands. Climb through the mysterious Inca ruins at Machu Picchu. View Spanish colonial balconies, art and architecture. This two-week EcoAdventure combines the unique flora and fauna of remote islands, colonial art and the massive, ancient stone temples of the Incas to make one of the most thrilling vacations of a lifetime. 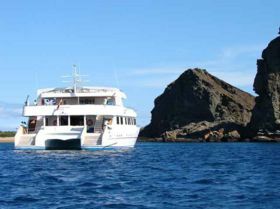 Select a 20-passenger yacht or a 100-passenger ship for a voyage through the ecological wonder of the Galapagos Islands. Extend your trip to the Peruvian or Ecuadorian Rainforests. And don't forget to check out EcoAdventures' optional archaeological tour extensions to the Plains of Nazca or to the Lord of Sipan. Day One: Home City to Quito Arrive Quito, colonial capital of Ecuador. Meeting service at the airport and transfer to your choice of hotel. 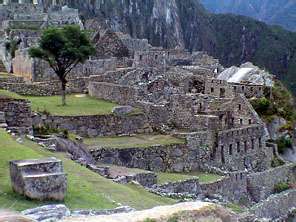 Or extend your trip to the Peruvian or Ecuadorian Rainforests. And don't forget to check out EcoAdventures' optional archaeological tour extensions to the Plains of Nazca or to the Lord of Sipan for exciting pre-trip extensions in Peru. Note: This itinerary can be reversed for the same price. Suggested Airfare: The airfare QUITO/LIMA/CUZCO/LIMA or vice-versa is NOT included and may vary from $260 per person to $650 per person depending on availability of space. IMPORTANT NOTE: Airfare quoted are subject to confirmation in the inventory required for the quote. Inventory is limited and airfares quoted are subject to change without notice and cannot be guaranteed until tickets are issued. NOTE: Galapagos cruises and airfares to/from the Galapagos Islands are NOT included in the quoted tour rates. The cruise rates are additional, based on selected cruise, category, and season. (See Galapagos Cruise and Charter Airfares for cruise options, itineraries, dates, rates, and ship information.) 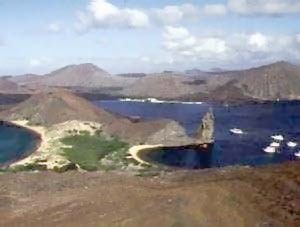 Galapagos National Park Tax of $120 per person NOT included and must be paid by each cruise passenger, either in advance or upon arrival at the Galapagos Islands. *In Tourist Class, the Expedition Train is quoted. In First Class and Deluxe categories, the VistaDome Train is quoted. 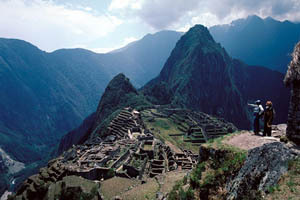 In the Deluxe & Deluxe Plus categories dinner is included at the selected Machu Picchu hotel.